A small piece of Cannon County history was shattered early Tuesday morning. 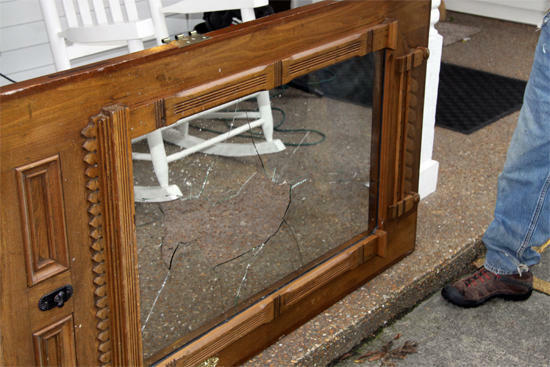 Vandals threw a large piece of asphalt through the 112-year-old glass of the front door at Smith Funeral Home on Murfreesboro Road. According to Christine Dillon of the funeral home, the door and glass have been part of the building, which was originally a home, since 1900. Dillon said the green glass is irreplaceable. The Woodbury Police Department and the Cannon County Sheriff's Department responded and investigated. The incident is one of several reports of vandalism which occurred around town overnight. It is not known if any of them are related. A visibly upset Dillion expressed anger over the breaking of the antique glass and wondered why someone would want to do something of that nature. Cannon County Sheriff Darrell Young theorized this morning that the incident at the funeral home and an attempted break-in at Jennings Jewelers could have been diversions in an attempt to draw law enforcement officers to those locations while the vehicles on Lee Ave., Kimela Dr. and Houston Lane were being burglarized. The sheriff sent his top investigator, Anthony Young, to assist the WPD in the investigation.